It may be cliche, but it’s also real. A new year challenges us to consider new goals. It’s a clean slate in many ways. As you consider what 2015 will hold for you, I want to encourage you to consider your spiritual growth in the new year and offer a Bible study resource to help. 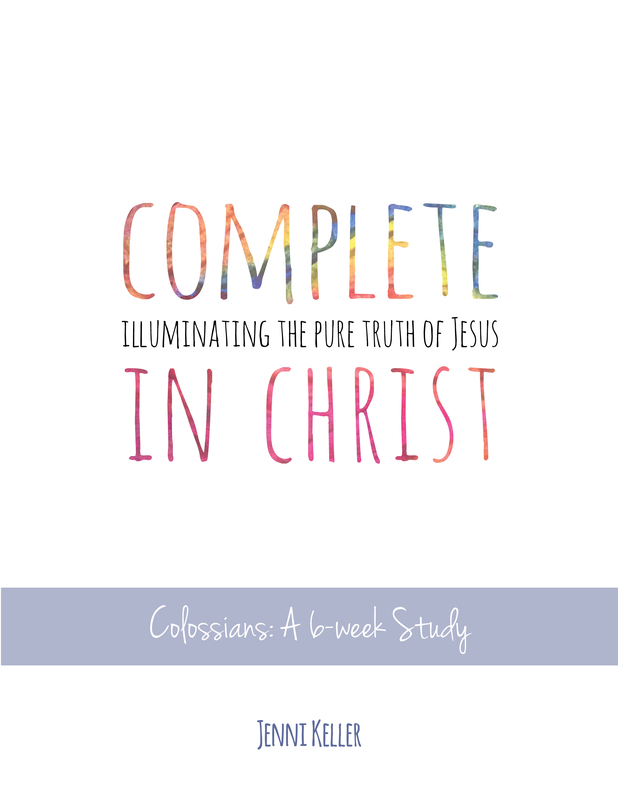 I’m humbled and honored to share my first Bible study, “Complete in Christ: Illuminating the Pure Truth of Jesus”, with you. It’s a six-week study of the book of Colossians. A book written by Paul to the baby church in Colossae. A book to believers who were struggling with outside voices who wanted to make Christianity about more that just Jesus. Paul was an amazing communicator. His descriptions of Jesus, his instructions for Christian living and simply the example of his own life in this book, are incredibly clear and inspiring. 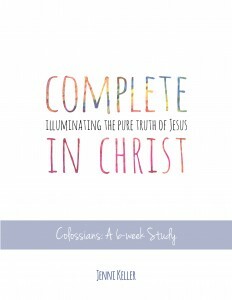 The format of the study allows you to look closely at the message, instructions, word choices and personal application of each section of the book of Colossians. It’s designed for five days of study each week, with an added opportunity to “Make it Personal” at the end of the week. I loved the process of writing this Bible study. I was amazed to find how rich Colossians is and relevant for our lives here and now. I became a big fan of Paul and inspired by his passion for Jesus and his gift to clearly communicate Truth. I’m excited to share what I’ve learned and open the door for Jesus to reveal himself in new ways to you through this book, too. You want to connect with your Bible and cultivate your passion for His Word in 2015? It would be my honor to inspire and encourage you on the journey through this study. 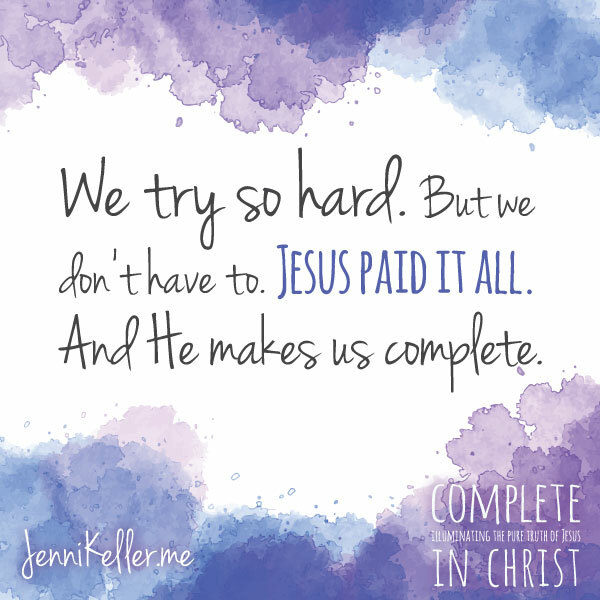 Purchase the eBook “Complete in Christ: Illuminating the Pure Truth of Jesus” in PDF or Kindle format here. I also invite you to participate in HelloMornings as we go through this study together, beginning Jan. 12. As we go through the study, I will post additional thoughts weekly on my blog. Several thousand women in countries worldwide are assigned to Twitter and Facebook-based groups and check-in with group members daily during the week for accountability, to share study takeaways, prayer requests and encouragement. I’ve been involved with HelloMornings since 2011 and have loved the community, accountability and encouragements I’ve received from it. I’d love for you to join us! Group registration begins Monday, Jan 5. Visit HelloMornings to learn more. So so proud of you! And so happy with my recent purchase from Jenni Keller bible studies. More to come, I’m sure! Just read day 3 and am overwhelmed by the thought of how the believers prayers may have affected Paul’s conversion. Wow. I’ve been a Christian since I was 4 (so for 34 years) and have NEVER stopped to consider that! I love this study thus far. Thank you!!! Thanks, Becky! I was amazed (and continue to be) at the richness in Colossians! Thanks for sharing your takeaway and for your encouragement for my first Bible study!